The CENTRAL MEANS OF PAYMENT ANTIFRAUD OFFICE (UCAMP) of the Italian Ministry of Economy and Finance released the annual report on Payment card frauds. This year I’m among the experts who worked on the MEF – Annual Report on Payment Card Frauds No. 5/2015, it has been an honor and a pleasure to be able to contribute to a so interesting document full of detailed data on the phenomena of payment card frauds. The document focus on payment card frauds (unrecognized transactions) issued in Italy and used everywhere. The value of fraud increased by 5%, while the number rose by 20%, with a reduction in the average value of individual transactions (from 177 € to 151 €). Since this is a trend already seen in 2013, it is possible to envisage a new criminal modus operandi that prefers fragmentation and multiplication of transactions to circumvent the thresholds of attention of both issuers and institutions of the users. The analysis of the series 2009-2014 describes a phenomenon under control, but, looking at the last two years, it is possible to notice a significant growth in the number of fraudulent transactions and an increasing role of the Internet as an emerging context of the implementation of fraud. In terms of payment channels exploited for fraudulent activities the Internet is characterized by a growing trend, meanwhile POS and ATM withdrawals are decreasing. However, we are witnessing a decrease in the average value of the individual transactions on all channels. Internet frauds increased for the fifth consecutive year (+ 11% in the incidence value and + 30% as the fraud value). Since 2011 the number of unrecognized transactions grew by more than 3 times and now accounts for over half the total number of fraudulent transactions. The phenomenon occurs especially abroad. 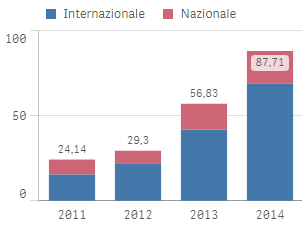 In the following graph are reported Internet frauds Italy/Abroad. In 2014, the increase in terms of number of unrecognized transactions on the Internet channel is greater than 60%. PoS frauds have decreased respect the previous year in both value and number. Also for 2014, as in all previous years, we have observed a trend towards a reduction of the phenomenon of fraud on ATM withdrawals. While in Italy is higher than the value of the defrauded, cheated on the card Italian expenses abroad detects a higher percentage of the number of fraudulent transactions (60%), of which the majority in the United States. The report is full of interesting data related to the credit card fraud, but this year it also includes a novelty respect previous version, a detailed analysis of credit card fraud activities in the dark web. The experts monitored the principal black markets during the entire 2014 monitoring the evolution of the offer for product and services related payment cards. 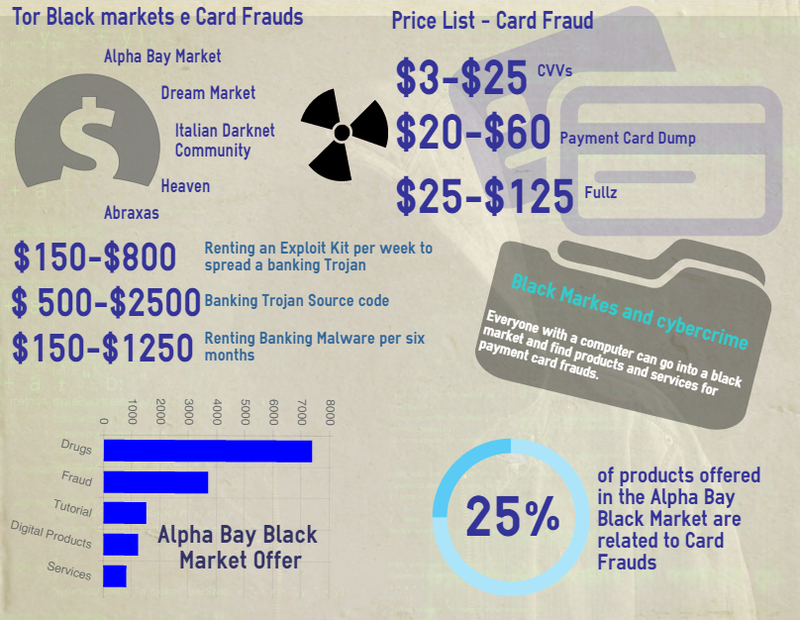 The Following Infographics include the principal data emerged from the analysis of the experts, anyway, let me suggest to carefully read the report that includes detailed info related payment card frauds.